North and South Korea agreed to hold military talks, a joint statement said after the two Koreas engaged in formal dialogue on Tuesday for the first time in more than two years. Russia welcomes dialogue between North and South Korea, a Kremlin spokesman said on Tuesday. The last North Korean to cross this heavily militarized border was shot by his own comrades, and barely escaped with his life. South Korea said on Tuesday it will consider a temporary lifting of sanctions against North Korea if it is necessary to facilitate the visit of North Koreans to the Winter Olympics in South Korea next month. China's Foreign Ministry said on Tuesday it was happy to see talks between North and South Korea take place, their first formal dialogue in more than two years, and welcomed all positive steps. U.S. President Donald Trump's tweet about having a bigger nuclear button than Kim Jong Un's has kept the North Korean leader "on his toes" and made clear the risks of a nuclear standoff, U.S. Ambassador to the United Nations Nikki Haley said on Sunday. North and South Korea will hold official talks next week for the first time in more than two years after Pyongyang accepted Seoul's offer for dialogue, just hours after the United States and South Korea delayed a joint military exercise. U.S. President Donald Trump on Thursday called potential talks between North and South Korea "a good thing" and agreed with South Korea there would be no joint military drills, which North Korea bitterly opposes, during next month's Winter Olympics. Amid ever-heightening tensions over North Korea’s nuclear weapons program, there are finally some positive diplomatic signals. On Jan. 3, Pyongyang reopened a long-closed border hotline with South Korea – one day after Seoul proposed bilateral negotiations and two days after Kim Jong Un said in his New Year address that he was open to speaking with the South. U.S. Defense Secretary Jim Mattis on Thursday played down a delay of U.S.-South Korean military exercises, saying they would resume after the conclusion of the March 9-18 Paralympics and that their postponement was simply due to logistical concerns. Potential talks between North Korea and South Korea are "a good thing", U.S. President Donald Trump said on Thursday in a post on Twitter in which he also took credit for any dialogue after Seoul and Pyongyang this week signaled willingness to speak. A court in Taiwan has released on bail a man prosecutors allege to have made false declarations in the case of a Hong Kong-flagged tanker suspected of transferring oil to North Korea in violation of international sanctions. The security situation facing Japan is the most perilous since World War Two because of North Korea's "unacceptable" provocations, Prime Minister Shinzo Abe said on Thursday and he vowed to bolster defenses to protect the Japanese people. The White House on Wednesday defended Donald Trump's tweet about the size of his nuclear button, saying Americans should be concerned about the North Korean leader's mental fitness, not their president's. North Korea reopened a border hotline with Seoul on Wednesday to discuss sending a delegation to the Winter Olympics in South Korea's Pyeongchang next month. U.S. President Donald Trump, responding to North Korean leader Kim Jong Un saying he had a nuclear button on his desk, said in a tweet on Tuesday that his nuclear button "is a much bigger & more powerful one than his, and my Button works!" The U.S. State Department said on Tuesday it is up to South Korea whether to hold talks with North Korea but Washington is skeptical of North Korean leader Kim Jong Un's sincerity if such talks happen. The International Olympic Committee (IOC) welcomed on Tuesday the possibility of North Korea competing at next month's Pyeongchang Games in South Korea and said the invitation remained open. After a year of making threats and weapons advances, North Korea's leader appears to be using the upcoming Winter Olympic Games in South Korea as a tool to blunt growing international pressure on Pyongyang while leaving his nuclear arsenal untouched. U.S. President Donald Trump on Tuesday said possible talks between North Korea and South Korea held mixed potential, while sanctions were beginning to take a toll on Pyongyang amid tensions over its nuclear and missile programs. China will continue to fully, accurately and strictly implement United Nations' sanctions on North Korea in accordance to Chinese laws, the commerce ministry said on Tuesday. South Korea offered talks with North Korea amid a standoff over its weapons programs, after North Korean leader Kim Jong Un said he was open to negotiations. 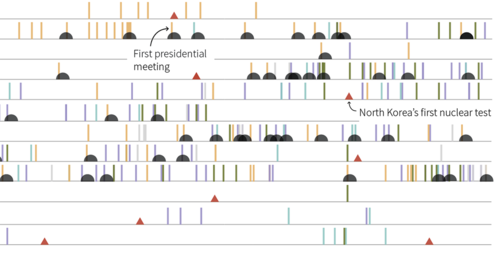 A Reuters analysis shows how in five decades of relations between North and South, communication has rarely been so barren. South Korea on Tuesday offered talks with North Korea amid a standoff over its weapons programs, a day after North Korean leader Kim Jong Un said he was open to negotiations but that his country would push ahead with "mass producing" nuclear warheads. The light-gray suit and matching tie North Korea's Kim Jong Un donned for his New Year's address was likely carefully calculated to project a softer, more relaxed image to go with his surprise offer for talks with Seoul, analysts said on Tuesday. After a year of threats and weapons advances, North Korea's leader appears to be using the upcoming Winter Olympic Games in South Korea as a tool to blunt growing international pressure on his regime while leaving his nuclear arsenal untouched. South Korean Unification Minister Cho Myong-gyon offered on Tuesday high-ranking government talks with North Korea next week at the border village of Panmunjom, a day after Pyongyang suggested talks despite sticking to its nuclear ambitions. South Korean President Moon Jae-in said on Tuesday the improvement of inter-Korean relations was linked to resolving North Korea's nuclear program, a day after the North offered talks with Seoul but was steadfast on its nuclear ambitions. Kim Jong Un warned the United States on Monday he had a "nuclear button" on his desk ready for use if North Korea was threatened, but offered an olive branch to South Korea, saying he was "open to dialogue" with Seoul. South Korea's presidential office said it welcomed Kim Jong Un's New Year speech where he raised the possibility of sending a delegation to the upcoming Winter Olympic Games to be held in Pyeongchang in the South, Yonhap news agency reported.